Last Sunday, after trying to get into The Meatball Shop with no avail, Marcus, Lisa, and I paid a visit to Little Muenster in the Lower East Side for some dinner grub. James, a former colleague of mine, had raved about it for quite some time now, so I was glad that I'd finally be able to report back. Little Muenster (gotta love that name!) 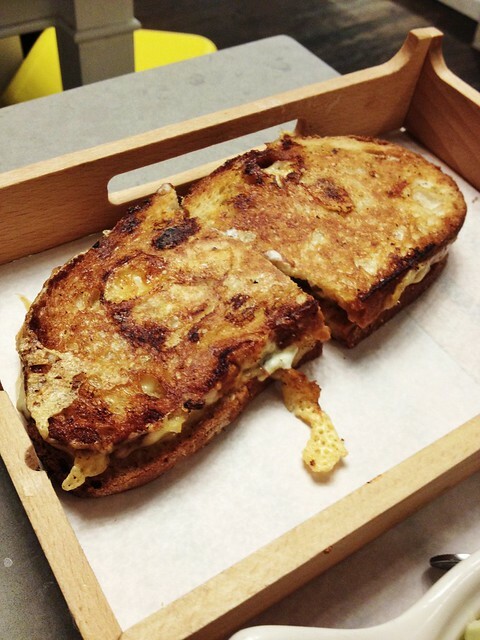 was opened by Adam Schneider and Vanessa Palazio, basing a lot of the grilled cheese menu offerings on "creative flavor mash-ups on their favorite pastas," including one sandwich with leek confit, Gruyère, chèvre, and pancetta. It may better explain its tagline of offering "super fancy grilled cheese." 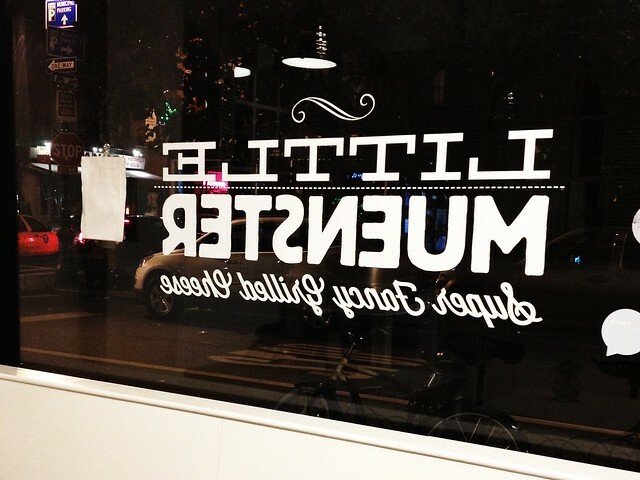 Another thing that makes Little Muenster quite the kickass joint is its delivery service -- not only do they offer it in the surrounding neighborhood but customers can request the sandwiches "be cooked on premises or delivered toaster-ready to protect against sogginess." Plus, the to-go packaging includes not only aluminum foil wrapped around sandwiches but also the boxes containing them allow the heat from them to vent. 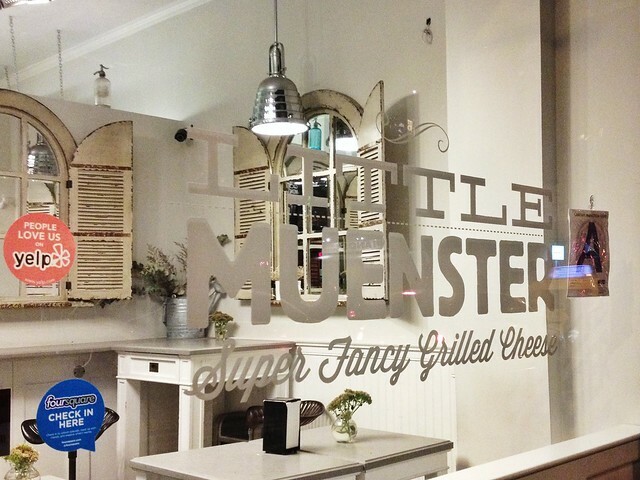 Couldn't get an excellent photo of the Little Muenster sign out front, so I resorted to using this cute window mirror to capture it! 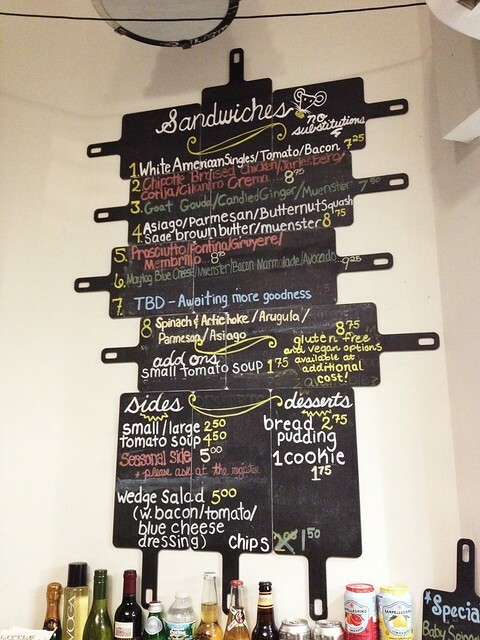 The menu is written on chalkboard painted cheeseboards/oven trays. Note there are no substitutions. 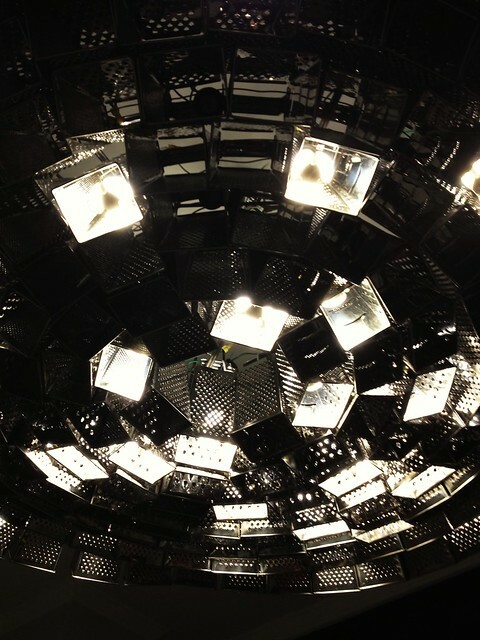 The coolest part of Little Muenster is this spiffy cheese grater chandelier. Really awesome! 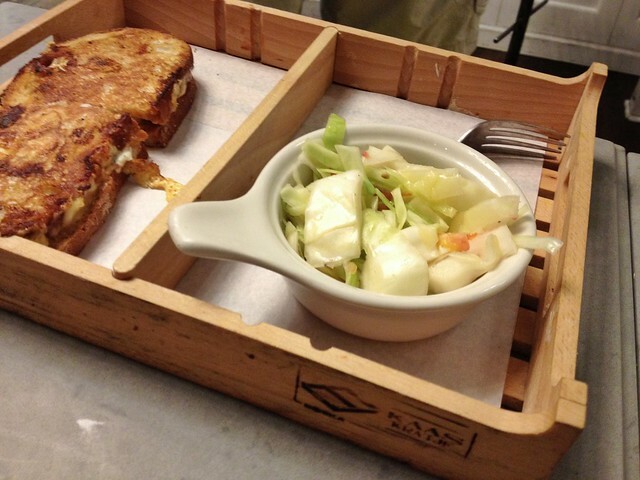 Each sandwich came with a cabbage side salad as well as these well-made wooden trays. Marcus had the chipotle-braised chicken with jarlesberg, cotija, and cilantro crema (#2). A very Mexican-spirited grilled cheese sandwich, the chipotle part of it gave the kick, while the blended cheeses with cilantro cream overlaid it an extra flair of flavor. Lisa had the savory blend of butternut squash with asiago, parmesan, muenster, and sage brown butter. Given from the description alone, you know it's going to be incredibly rich and undoubtedly cheesy. Even for a cheese lover like Lisa, it proved to be a little overwhelming for her, but still delicious nonetheless. It'd be perfect so split this with someone and order a soup to go with the half. 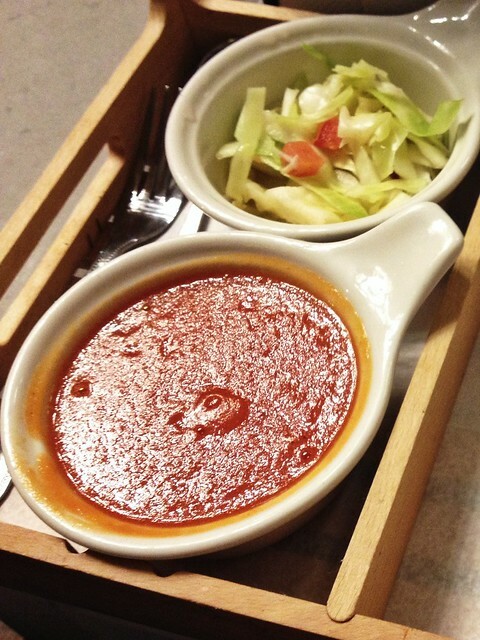 Lisa also had the tomato soup which was nice and thick with a little smokiness to it. It's the best complement to any of the sandwiches on the menu. I had the prosciutto with fontina, Gruyère, and membrillo (i.e., quince paste). The taste of the quince fruit is like a cross between an apple and a pear, and it somehow had the same culinary magic with the prosciutto as its classic pairing with a juicy slice of melon. Packed with a formidable crunch from the well-buttered, thoroughly toasted slices of bread, this sandwich is a solid winner. Despite the heaviness from our sandwiches sitting in our stomachs, Lisa and I still managed to make room for dessert. The bread pudding was sprinkled with a generous helping of confectioners' sugar, resulting in moist cubes of vanilla-flavored bread.It was the savory kind of dessert where it wasn't overly sweet or rich but instead a lovely punctuation to a relatively intense dinner of melted cheese between bread slices. Recommended to share! 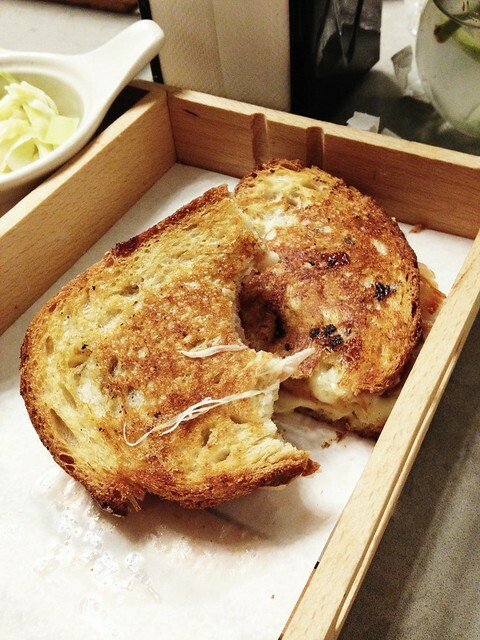 Findings: Little Muenster may rival my devotion to Morris Grilled Cheese and Milk Truck Grilled Cheese. I like that it offers menu items much different than the others (besides the essentially classic kind with bacon) so there is no culinary redundancy in the grilled cheese sammy market here in New York City. 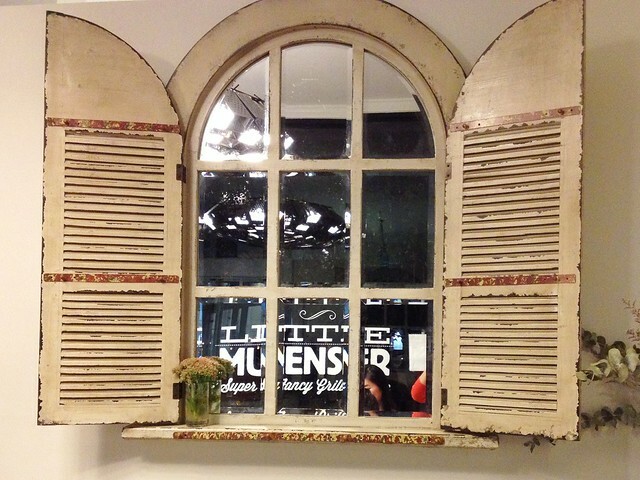 It seems as if the menu at Little Muenster changes every so often, so that promises new experiences each time you may go. The storefront may be small, but don't let size fool you one bit. The kitchen is cooking up some remarkable combinations of melted cheeses, savory proteins, and other gourmet ingredients. 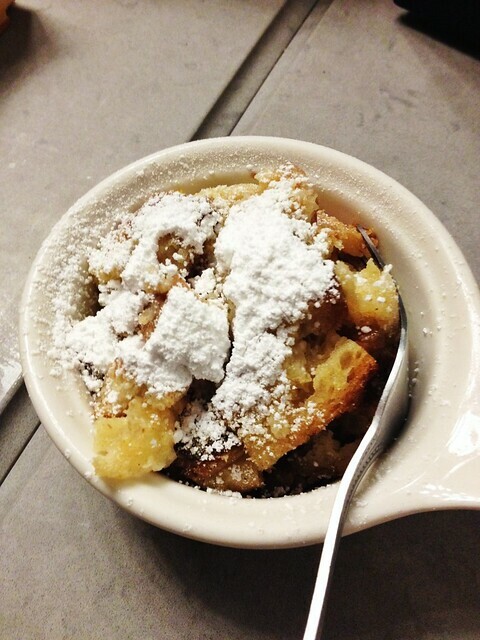 Plus, the bread pudding is pretty great, too. Price point: $8.75 for each grilled cheese sandwich, $4.50 for a cup of tomato soup, $2.75 for dessert.